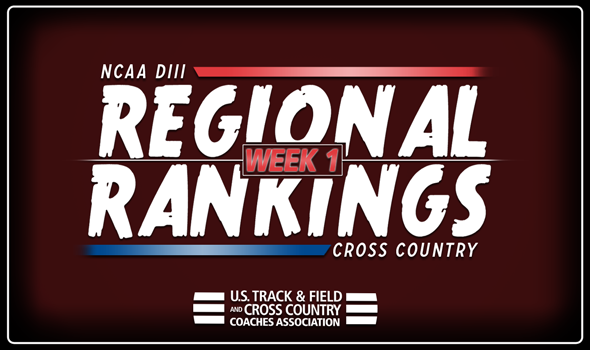 NEW ORLEANS – We are 12 days into the NCAA Division III Cross Country season and we’re already beginning to see some changes in the Regional Rankings, as released Tuesday by the U.S. Track & Field and Cross Country Coaches Association (USTFCCCA). No top-ranked teams met their demise, but there are four new second-ranked teams in the Regional Rankings in Week 1 compared to the preseason. There were no changes to the top-5 of the men’s rankings as No. 1 RPI leads the way, followed by No. 2 SUNY Geneseo, No. 3 RIT, No. 4 St. Lawrence and No. 5 Rowan. A bunch of changes befell the women’s rankings as SUNY Geneseo is the only team that remained in place in the top-5 at No. 1. Ithaca tumbled four spots from No. 2 to No. 6, which opened up spots for RPI, TCNJ and St. Lawrence to move up one spot from the preseason. Hamilton was the big gainer, moving up five spots from No. 10 to No. 5. There were no changes to either top-5 in the Central Region. Carleton, Wartburg, Cornell College, Loras and St. Olaf sit in order in the men’s rankings. Carleton, St. Thomas (Minn.), Wartburg, Nebraska Wesleyan and Gustavus Adolphus are in order in the women’s rankings. Calvin is still No. 1 in the men’s rankings, but there were some changes behind it. Albion and Otterbein both moved up one spot from No. 3 to No. 2 and No. 4 to No. 3, respectively. Trine soared from No. 8 to No. 4 after dominating the Wittenberg Invitational. Mount Union is now No. 5 following a good effort at the course that will host the regional meet. Allegheny (Pa.) maintained its top spot in the women’s rankings, but Calvin made up some serious ground. The Knights charged from No. 5 to No. 2 behind a strong effort at their own invitational this past weekend (fourth place). Hope, former No. 2 Otterbein and former No. 4 Oberlin are the remaining teams in the top-5. The top-3 teams in the men’s rankings remained the same: No. 1 Haverford, No. 2 Carnegie Mellon and No. 3 Johns Hopkins. All three raced so far but have rested key performers. Moving up from the preseason were Dickinson (No. 5 to No. 4) and Stevenson (No. 6 to No. 5). The top-3 teams are entrenched atop the women’s rankings: No. 1 Johns Hopkins, No. 2 Dickinson and No. 3 Carnegie Mellon. Haverford and Elizabethtown swapped spots from No. 5 to No. 4 and No. 4 to No. 5, respectively. There were no changes to the top-5 of the men’s rankings as North Central (Ill.), UW-La Crosse, Washington (Mo. ), UW-Stout and U of Chicago are all in their familiar spots. The women’s rankings changed a bit as the Maroons joined the top-5 behind Washington (Mo. ), UW-Eau Claire, Wheaton (Ill.) and UW-La Crosse. The top-5 in the men’s rankings went unchanged: No. 1 Amherst leads the way, followed by No. 2 MIT, No. 3 Middlebury, No. 4 Williams and No. 5 Connecticut College. The women’s rankings didn’t see anything change in the top-5, either: No. 1 MIT is at the top, followed by No. 2 Middlebury, No. 3 Williams, No. 4 Tufts and No. 5 Bates. The men’s rankings remained the same: No. 1 Rhodes is on top, followed by No. 2 Emory, No. 3 Christopher Newport, No. 4 Washington and Lee and No. 5 Bridgewater (Va.). The women’s rankings weren’t changed at all, either: No. 1 Emory tops the chart, followed by No. 2 Lynchburg, No. 3 Trinity (Texas), No. 4 Centre and No. 5 Washington and Lee. Don’t look for any changes in the men’s top-5: No. 1 Pomona-Pitzer is No. 1, followed by No. 2 UC Santa Cruz, No. 3 Claremont-Mudd-Scripps, No. 4 Occidental and No. 5 Willamette. The women’s rankings saw a huge change as Claremont-Mudd-Scripps has two teams hot on its heels: No. 2 Pomona-Pitzer and No. 4 Occidental. The Sagehens and Tigers jumped multiple spots from the preseason with the former being led by a strong freshmen class. Colorado College fell from No. 2 to No. 3 and Whitman stays at No. 5.